I have the duty to oppose the government when their decisions are unlawful or are not in the best interest of the tsa-wa-sum. I have this sacred duty at two levels: first, personally, as a citizen of this great country; and second, officially, in my capacity as opposition leader. My last entry was a “personal” attempt to oppose our government’s decision. Through this blog, I have made my personal views on the medical grant issue public. Naturally, I hope that my humble views may receive favour of our government’s attention. Similarly, but more importantly, many of you have also expressed your personal views in this blog and other on-line discussion fora. I believe our government will give serious consideration to all constructive comments, regardless of how they are communicated. But what will I do officially? As opposition leader, I still do not know the full story. I don’t know the real objectives of the grant, the number of private students it would cover, criteria for selecting students, obligations of the students, financing source, and how the scheme will be implemented from the new academic session onwards. I also don’t know if the government is considering similar assistance for private students specializing in other professions. So, as opposition leader, I have spoken with people in the cabinet secretariat, ministry of education and ministry of health. I have also written “officially” to the ministry of education, who will presumably implement the scheme, requesting for information. Their feedback, your views, and the government’s response will determine if I, as opposition leader, should “officially” oppose our government’s decision. Our government will make mistakes. But know that the opposition’s earnest belief is that, when that happens, our government will admit their mistakes, apologise for them and take corrective measures – all this without “official” opposition. The public has been quite vocal. This is good for democracy. But our media has not given any attention to the public’s growing concern on medical grants. This is not good for democracy. Today is World Maths Day. And children throughout the world are celebrating mathematics by solving mental arithmetic questions online. Their goal is to set a new world record in the number of questions they collectively answer in 48 hours. But the real objective is to make maths fun. And to promote numeracy among students. Last year more than 1 million children from 20,000 schools and 150 countries set a new world record by correctly answering 182,455,169 questions in 48 hours. The organizers of the event already predict that, by tomorrow, another world record will have been set. The competition began at 5PM yesterday. So the competition will go on for another 31 hours even as I post this entry. And that means there’s still time. Registration is easy and free. All you need to register and participate in the event is internet access. Our ICT facilities are rudimentary, at best. And most schools do not even have computers. Still, where the facilities are available, make use of them. Go online. Register. And get a few students – yes, even if only a handful – to participate. We can set our sights higher next year. And perhaps even borrow the idea and adapt it for our specific conditions. For more information go to the WMD website. Or read Maria Miller’s blog. The construction of the college, which began only in October 2007, is already nearing completion. 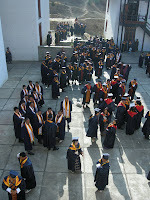 And by July this year, Bhutan’s first private college will have admitted its first students. These students will be fortunate. Dormitories, classrooms, auditorium, sports facilities, gymnasium, dining hall, cafeteria, club house … the facilities they’ll enjoy are equal to those of the best colleges in our region. These world class facilities were planned, designed and built by our own people. Gandhara Designs developed the master plan, zoning and all designs and drawings. And Phuensum Builders are the civil works contractors. Together, these two firms have shown that our construction industry, especially our architects, have come of age. Only a few government officials have visited the college so far. Many more should visit. They’ll see that it is possible to improve the quality of construction in our country. And they’ll see that it is possible to develop education as a viable industry in our country. But to improve the quality of construction or of private education the government must play a more meaningful role. It must provide vision. And genuine support to realize that vision. The RTC’s motto is “Inspiring Education in Bhutan.” I am inspired. Team teaching – a new pedagogic method practiced in urban schools to address classroom shortages and high enrolment; two teachers teach one class; while one teaches, the other monitors the class and helps students; the two teachers share homework correction duties. This week, Kuensel wrote about “team teaching” being introduced in Thimphu schools. Multigrade teaching – a pedagogic method practiced in community schools to address teacher shortages; one teacher teaches several classes together, in the same classroom; that teacher teaches all the subjects for all the classes; and that teacher does all the homework correction, for all the students. Last week, Kuensel wrote that community primary school teachers are required to do “multigrade teaching”. The two Kuensel articles, published one after the other, in two consecutive issues, are disturbing. Together, the articles indicate that our rural schools face a shortage of teachers, while our urban schools could be having excess teachers. Yesterday, BBS reported exactly that. The National Assembly, our nation’s highest legislative body, spent a good 30 minutes yesterday talking about a school in Gasa. The issue was tabled by the Honourable MP from Gasa, Dasho Damcho Dorji, the other opposition member, on behalf of the people of Gasa. The people want the government to reverse its decision to downgrade Gasa LSS to a primary school. The people argue that if their school is downgraded, fewer of their children will be willing to continue their studies, after completing Class VI, in the boarding school in distant, wetter and hotter Jeyshong. Lyonpo Thakur Singh, our education minister, claimed that he had consulted the dzongkhag authorities. That’s the problem. He should have consulted the people, not bureaucrats. Civil servants report to, and are accountable to, the government, and, some times, will not represent the best interests of the people. If Lyonpo Thakur had consulted the local government instead, he would have understood their difficulties and seen their aspirations. And a decision, regardless of what the decision, could have been made jointly. And the local government would not have raised the issue about Gasa PS in the National Assembly. And its honorable members would not have spent 30 minutes, one-sixth of the total time, talking about a remote school in Gasa. Decentralize. Please. And strengthen local governments. Gakiling has 13 villages. Some of the poorest parts of our country can be found in this cluster of villages that lie along the remote parts of upstream Amochu. Together, the 13 villages have just one school – Rangtse Community School, which opened two years ago after Her Majesty Ashi Dorji Wangmo Wangchuck visited the area. None of the villages is connected by car road. Most don’t even have mule tracks. 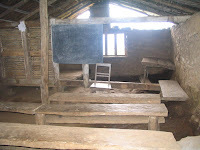 So the school in Rangtse is not accessible to children living in other villages. And the children can’t live in Rangtse, because the school does not have boarding facilities. Naturally, the people of Gakiling are anxious. They want schools. They need schools. But they have no idea if their needs will be met during the 10th Plan. They have no idea because no one consulted them. Education used to be decentralized. And local governments could decide, within the overall education policies and guidelines, where to build their schools. But this is no longer the case. The entire education system will be planned and executed by the centre. That must be the case, because the centre – the education ministry, in this case – has been allocated all the money. And local governments have been given nothing, not even one ngultrum, to develop education in their communities. During the 10th Plan the Education Ministry will receive Nu 9.5 billion for capital investments alone. Compare this to what has been earmarked for the 20 dzongkhags – Nu 7.2 billion for all their activities; or what has been given to the 205 gewogs combined – just Nu 4.8 billion. This makes the education ministry very powerful. But its power comes at a high price: decentralization is suspended, and local government is suppressed. That’s not good. Local governments, after all, understand the aspirations of their people better than any expert in Thimphu. And they have much more at stake. For now, the people of Gakiling are at the mercy of the centre. So are the people of Sombaykha, another gewog with no road and only one proper school. Both, Gakiling and Sombaykha are in my constituency.